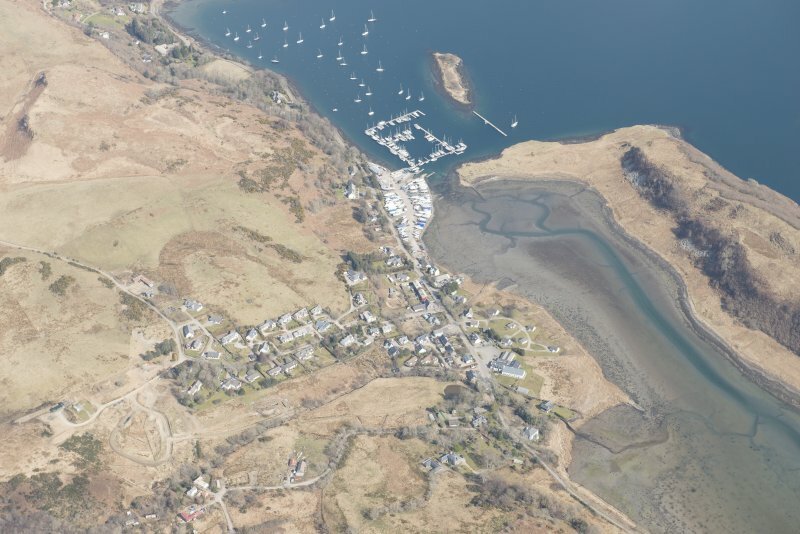 General oblique aerial view of Ardfern, looking NE. 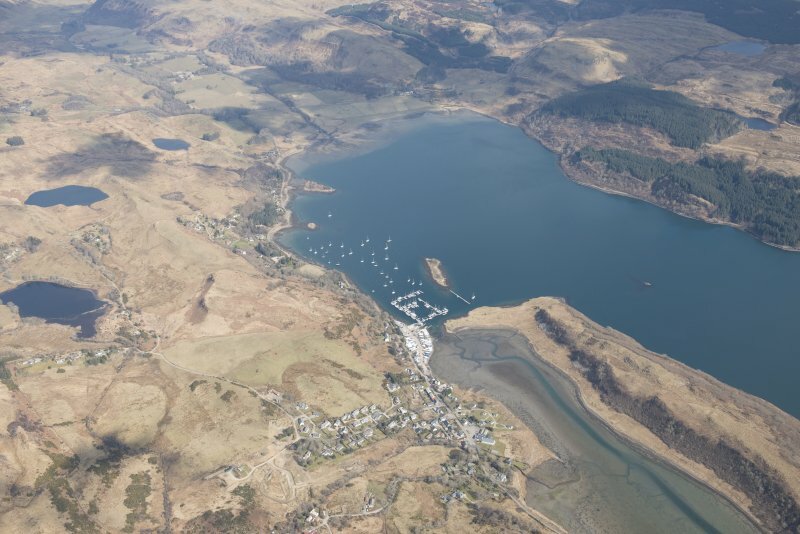 General oblique aerial view of Ardfern, looking ENE. Publication drawing; chambered cairn, Clach an t'Sagairt. Photographic copy. This ruined cairn is in an undulating field with many knolls of outcrop overlooking Loch Craignish. Though not on one of the higher knolls, the site is conspicuous. About two feet of cairn material remains, but the edges have been much disturbed and cannot be defined precisely. The cairn appears to have been round with a diameter of about 50'. On the SE side, the edges of three flat slabs set in line project from the cairn edge . They appear to be part of some walling but may be no more than out- cropping rock. In the centre of the cairn is a cist or chamber irregular in plan. It is formed by four orthostats giving an internal length of 7'1" by a maximum width of 4' 6" and is surmounted by a capstone, broken at its north end, now measuring 7' by 5'2". A fifth orthostat to the SE now leans to the south. In its original position, it may have closed the SE corner of the chamber or it may have formed part of the NE wall of a passage leading to the SE. When the chamber was cleared out, in about 1920, ashes and bone splinters were found on or near the floor. Other finds included dark brown sherds, said to resemble food vessel pottery, and several brass plaid-brooches, one of which is in the West Highland Museum at Fort William (Accession no 383). The other artifacts, believed to have been at Lunga House, are now lost. A Graham 1950; M Campbell and M Sandeman 1964; A S Henshall 1972. The cairn, which stands to a height of 1 metre is as described. Visited by OS (R D) 12 October 1971. 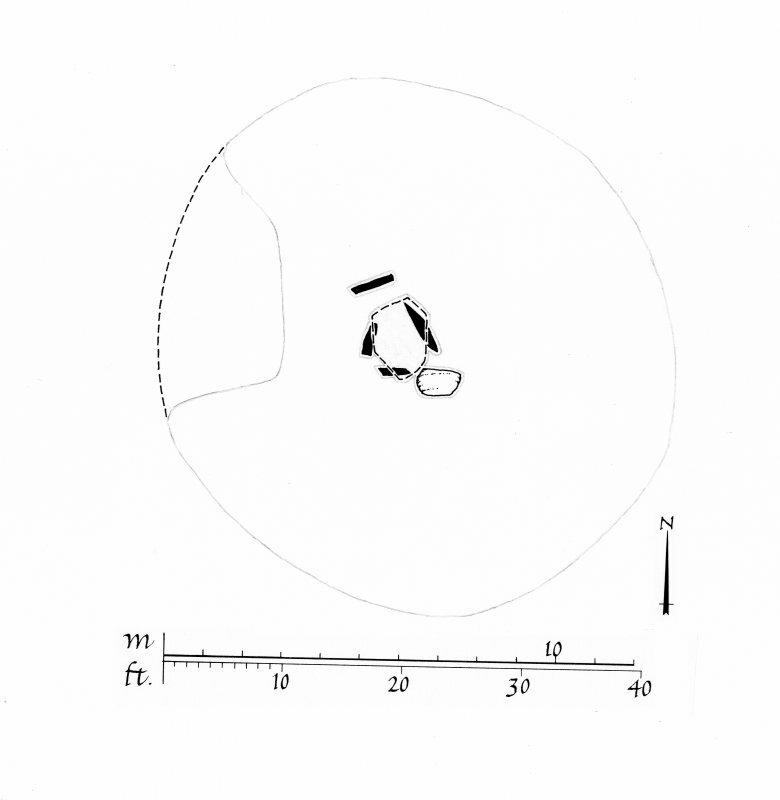 The simple chamber of this tomb rises above the remains of what was probably a circular cairn about 13m in diameter situated 250m SSE of Soroba (Campbell and Sandeman 1964; Henshall 1972). Three stones form the main part of the chamber, which measures 1.6m by 1.3m and 0.6m in present height internally, and which is covered by a single capstone (1.8m by 1.6m and up to 0.3m thick). A little to the NW there is an upright slab (1m by 0.15m and protruding 0.45m), but its relationship to the chamber is not clear. There is a large displaced boulder to the SE of the chamber. When the chamber was emptied about 1920 'ashes and splinters of bone' were found near the floor, and fragments of pottery (now lost), which were said to resemble Food Vessels, were recovered from the layer above this (the excavation of the tomb is mentioned by Graham, where the contents are described as ' pieces of broken pottery and one or two plaid pins of much later date' - Graham 1950). RCAHMS 1988 (visited June 1979).